Please send an email to sales@simplesoft.com to request information for pricing, licensing and other questions about our solutions. "SimpleAgentPro has enabled our training teams to offer hands on experience with fully populated systems. The fact that we have been able to provide this kind of simulated environment in one location, has allowed us to provide remote simultaneous training to customer offices worldwide." SimpleAgentPro® is a Network Management Simulator with an easy to use GUI that can simulate an entire network of LAN-WAN components made up of thousands of manageable devices. Used by many of the leading network management vendors including HP, CA, BMC, IBM and Cisco, SimpleAgentPro has become the industry standard for network management simulation all over the world. Using this tool, management application vendors and system integrators can quickly develop, test and demonstrate management applications without requiring thousands of expensive and bulky hardware boxes. Enterprise Level simulations, made up of thousands of devices, can be distributed over multiple servers and still controlled from one user interface. Each simulated device can support its own MIBs, data, and IP Address. SimpleAgentPro's unique ability to create default variables from MIB or simply learn variables from an existing agent and its built-in support for dynamic values allows it be setup quickly. The use of Tcl based scripting allows for advanced modeling of agent behavior, trap generation, creation of error scenarios and expression of inter-relationships between MIB variables. Development teams can develop management applications even when the agent to be managed is incomplete or absent. A MIB definition file alone is enough to instantly allow the SimpleAgentPro to simulate an agent which supports that MIB. Application development can now proceed in parallel with agent development, thus significantly shortening the "time-to-market" and the associated development and testing costs. Testing departments can test management applications without requiring large inventories of testing devices in the lab. Even large networks with thousands of devices can be quickly simulated without requiring large budgets. Full control over the values returned by the agent for SNMP requests and the ability to generate SNMP traps on demand enable thorough testing of applications. Sales organizations can give demonstrations of management applications at customer premises or during trade shows without having to carry tons of bulky equipment and spend hours configuring it. Hundreds of different devices can be simulated on the management station itself or on portable laptop PCs. Training groups can give animated, mobile demos of different networking scenarios by setting up user defined Tcl scripts to generate traps, change interface status, create error conditions and make agents stop responding to SNMP requests. Costly hardware, installation and set-up can be eliminated and initial network environment can be easily restored after students have been trained on "set" configuration requests. The SimpleAgentPro is available on a variety of platforms (Redhat Linux, Windows 7/8/10/2008/2012), from high end workstations to laptop PCs. It can even run on the same machine that runs your management application, to create a self-contained development and demonstration environment. The device simulation files are ASCII files and can be shared by everyone in the organization. Engineering and Testing departments can use them on UNIX/Win machines, while Sales and Marketing departments can use the same files on Windows laptop PCs. For use in the Cable Industry, an easy to use, Cable Wizard interface is also provided to quickly simulate thousands of CM/MTAs. This can be used to carry out pre-deployment and error scenario testing of the provisioning and management software. Use the built in MIB compiler to load the MIBs supported by the Agent. Use the built in MIB Instance creator to define the variables to be supported or use the MIB learner to learn them from an existing agent or simply select from pre-existing devices in the device library. Edit the instance and value information if required. Valid defaults are automatically created. The SimpleAgentPro is now ready to receive SNMP Get/GetNext/GetBulk/Set requests and send replies. Simply repeat the above steps for each additional device to be simulated, or simply "clone" the added device. Use Tcl based scripts to emit any selected trap on demand. Shortened "Time to Market" by allowing development of management applications to proceed in parallel with Agent development. Improved quality of management applications and allows testing with hundreds of devices. Demonstration of capabilities of management applications in the absence of an agents at trade shows, customer sites or in training classes. Duplication of your production network in your test bed for trying out scripts, training and disaster recovery testing. Controls the value returned for each variable. Value types like fixed, sequential, random, randomUp, clock based, lastset supported. Allows editing of instance information to suit your needs. Generate SNMP Traps or change MIB data via Tcl scripts that get executed based on timers, user request or part of PDU processing. Supports dynamic row creation via new instance, EntryStatus and RowStatus methods. Supports IPMI ver 1.5/2.0 capabilities. Supports Netflow (5,7,8,9), IPFix, sFlow capabilities. Uses Tcl based scripts to better model agent behavior and inter-relationships between MIB variables. Exposes APIs for user defined integration. Provides the capability to learn traps from devices and to generate traps from a device to be sent out to multiple trap managers. Provides utilities to ease learning, trap generation and RMON support. Can support up to 10,000 devices depending on available system resources and type of simulation. SimpleAgentEnterprise available for even higher device counts. Versions of SimpleAgentPro limited to simulating up to 5, 50, 250, 1000, 2500, 5000, and 10000 devices are also available. Keep a log of SNMP requests in debug mode. Includes a MIB Browser for generation of queries to simulated devices. Displays device vendor information in graphical thumb-nail view. Wizards for popular Management platforms available to import managed devices and quickly duplicate production network. Topology editor included to create router/switch based topology maps. Supports additon of your own devices to the device library. Simple, intuitive, easy to use interface. Over 250 companies in 31 countries have benefited from SimpleAgentPro. Users include Cisco, CA, HP, BMC, Alcatel-Lucent, IBM, Comcast, Verizon, Tellabs, Nortel, Boeing, Microsoft, Intel, Lockheed Martin, General Dynamics, US Airforce, Ericsson, Siemens, Infovista, Entuity, Nokia, and NTT. Detailed information about SimpleAgentPro and its features is provided below to enable potential customers to make educated decisions and prevent the spread of false information by others. Major Releases About every 6 months. Minor Releases Bug fix release if necessary. Ease of Use Very simple to use and setup. Uses intuitive, non Tk based, native GUI. Licensing Software key based licensing supported on Windows and Linux. Types 5, 50, 250, 1000, 2500, 5000, and 10000 versions. SimpleAgent is available for one device simulation, and SimpleAgentEnterprise is available for 15,000+ devices. TCP/IP stack Native on and Linux and Windows. Max. number of devices Up to 10,000 devices depending on available resources and type of simulation. SimpleAgentEnterprise available for larger device counts. IPMI ver 1.5/2.0 Simulated devices can respond to IPMI queries in addition to SNMP and Telnet. IPMI learning can also be done from within SimpleAgentPro and a separate IPMI learner application is also included. IPMI ver 2.0 support is available in the AES version as it uses AES-128 for encryption. Telnet/CLI Simulated devices can respond to Telnet/CLI queries in addition to SNMP and TL1. Telnet/CLI learning can also be done from within SimpleAgentPro. A separate Telnet learner application is also included. SSH Users can login to simulated devices via SSH and access the CLI interface. CLI interface used in Telnet is also available via SSH with some export restrictions. HTTP/HTTPs Simulated devices also respond to http and https requests from a web browser. A separte http learner application is also included. TL1 Simulated devices can respond to TL1 queries in addition to SNMP and Telnet/CLI. TFTP Simulated devices can act as TFTP servers as well as TFTP clients. FTP Simulated devices can act as FTP servers (on Linux) as well as FTP clients. DHCP Simulated devices can make requests for IP addresses sequentially and in parallel. SOAP over HTTP/s Simulated devices can respond to SOAP requests over HTTP/s based on information in SOAP modeling file. The modeling file can be created from WSDL documents or by parsing WireShark captures. REST over HTTP/s Simulated devices can respond to REST requests over HTTP/s based on information in REST modeling file or RequestResponse file. The modeling file and request_response file can be created from learnt interaction with a real device. Documentation Acrobat PDF format, HTML based Web help system. Open APIs Published C/C++/Tcl interfaces to allow other applications to interface with SimpleAgentPro. Java and Perl packages for interfacing are also included. Multiple Invocations Allows multiple invocations in 10000 mode for easy sharing among multiple users. Pricing Please contact sales@simplesoft.com for current pricing. Site licensing/Multiple copy discounts Steep discounts available for multiple copy purchases to simulate very large networks. Discounts start from 3 or more copies when purchased at the same time. Command Line All functionality available in command line mode for easy automation. Technical Support Email/phone support available with an average time of response of a few hours. Dynamic row creation Supports new instance, RowStatus, EntryStatus methods of dynamic row creation via manager SET requests. Device Libraries Includes pre-learnt devices from Cisco, Juniper, Brocade, HP, Riverstone, Extreme and others. New user defined devices can also be easily added to the device library. Advanced Modelling Dynamic simulation support is built-in. Additional agent behavior modelling can be done via TCL based scripts. TCL commands provided to generate traps, change ping/SNMP status and manipulate instances/values. Network Scenarios Device and Map level network scenario scripts can be predefined and then run through simple pop-up menus during sales and training demos. Topology Editor Graphical tool allows you to create router/switch/host based interconnected networks, and convert them into running simulations. MIB Browser MIB Browser is included to generate SNMP queries to simulated devices. Multiple network cards Supported on Linux and Windows. Control agents Each agent's behavior can be fully controlled while running. Devices can be made to stop responding to pings, SNMP or both. All values, instances, rates can be changed. sysUptime can also be controlled. Individual devices can be started, stopped and restarted without bringing entire map down. Traps Traps, Notifications and Informs can be configured to be sent as part of pdu processing, timer events or at startup. Syslog Syslog events can be generated by the simulated devices. Built-in utility can also learn syslog events by first receiving them for subsequent replay. MIB and Variables MIB and variable files can be shared by multiple devices. Values of variables have built-in default dynamism without requiring any setting up and scripting. Counter rates can be fully controlled via simple tcl command. Runtime changes to Variables Both Read-Only and Read-Write variables can be changed without stopping the simulation. Rows can be dynamically added and deleted for provisioning. Memory Utilization Configurable based on CACHE_SIZE. Allows devices with large number of variables (100,000+) to be easily supported in very small amounts of memory. Performance Greater than 1750 Pdus/sec. (Pdu contained a single variable GET request on PentiumII/400Mhz/256M). Multi-processor support Implementation uses threads to make use of multiple processors when available. Remote console Can control simulations running on multiple machines to provide unlimited scalability. Multi-user support Available on Linux with setuid, and through multiple invocations on Windows. SNMP transmission delay Can control delay for each device. Packet drops Each device can simulate packet drops at a specified rate. MAC Address support Available on Windows NT with proprietary UDP/IP stack. Custom actions hooks Actions in the form of tcl scripts can be specified at start up, during pdu processing, at the end, and based on timer events on a per device basis. SNMP tracing Both SNMP request,responses and traps can be traced at both PDU level as well as raw packet level. Large Tables New version supports very large tables with thousands of rows without large memory requirements. Sharing of MIBs and data Compiled MIB files and data files can be shared by multiple devices. Device specific information like IP address from data files is automatically mapped. Different MIB versions Different devices can be easily setup to support different versions of the same MIB. TFTP Client TFTP client support is part of the product. FTP Client FTP client support is part of the product. TFTP Server Add-on TFTP server module available. FTP Server FTP Server module support available on Linux. DHCP DHCP support is part of the product. DHCP Relay Agents are also supported. ToD ToD support is part of the product. Diffie-Hellman Diffie-Hellman kickstart key change is supported. Command line Generation Supported. Traps and syslogs can be generated using command line utility for devices in currently running maps. Creation from MIB Supported. Traps with appropriate data can be automatically created based on TRAP-TYPE and NOTIFICATION-TYPE macro definitions in MIBs. Learning from Device Supported. Traps with appropriate data can be automatically created based on TRAP-TYPE and NOTIFICATION-TYPE macro definitions in MIBs. Learning from Logs Supported. Traps from multiple devices can be replayed with appropriate data based on data in log files. Date Introduced First product in the market to introduce this innovative idea (Dec 1994). Built-in Support Capability is part of the product and need not be purchased separately. Detect GetNext errors Yes. Can also be configured to ignore them and continue learning and resort later. Limit table sizes Yes. Will limit learning to only the specified number of rows. Start learning at any point Yes. Learning can be started from any point in the MIB registration tree. Limit to one subtree Yes, only the specified sub-tree can be learnt. Ignore subtrees Yes, specified MIB sub-trees can be ignored. Slow down retrieval Yes, a delay can be injected between two SNMP learn queries. Learn without MIB Yes. All variables supported by the agent can be learnt. Learn only from MIB Yes. Can restrict learning to only those variables that are present in the specified MIB(s). Learn many devices in parallel Yes. Command Line Utilities Separate utilities included in the product to allow learning at customer premises without licensing requirements. Learing polled responses Poller utility is included that records multiple polled responses from a real device so that they can be replayed by simulated devices. Learn large networks Discovery wizard present to learn from seed router, subnets and IP ranges. Command line utiltiies also available to do parallel, multi-threading SNMP walking and discovery at customer sites. Learn from Network Management Apps. Wizards present to import data from popular management applications like HPOpenView, CA Spectrum, CastleRock SNMPc and others. 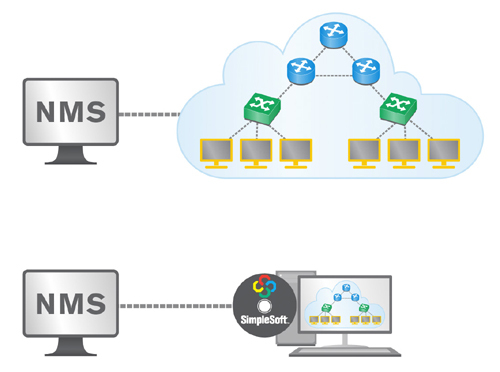 Simplifies the task of duplicating production network in your test bed. SMI supported SNMPv1 and SNMPv2C SMI supported. Leniency Very lenient. New MIB Compiler uses a best-effort mode to extract maximum information from MIBs with syntax errors. Automatic resolution of dependencies Can automatically look for imported definitions by searching through all the MIB files in a specified directory. MIB files Over 2000+ MIBs included.